Preheat oven to 350 degrees. On a lightly floured work surface, roll out puff pastry to a 12-by-16-inch rectangle. Transfer to a parchment-lined rimmed baking sheet and trim to make a neat rectangle. Freeze until firm, 10 minutes. With a fork, prick pastry all over. To prevent pastry from rising, top with a sheet of parchment paper and stack another rimmed baking sheet on top. Bake until light golden, 20 to 25 minutes. Meanwhile, in a food processor, combine 1/4 cup pistachios and sugar and process until pistachios are finely ground. Sprinkle mixture on pastry, leaving a 3/4-inch border. Bake until pastry is deep golden and pistachio mixture begins to turn golden, 15 to 17 minutes. Roughly chop remaining 1/4 cup pistachios. 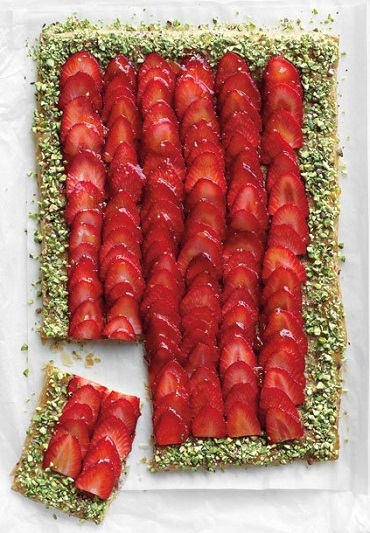 Remove sheet from oven; arrange strawberries on pistachio mixture, overlapping slices. Brush berries and border with jam and sprinkle chopped pistachios on border. Serve warm or at room temperature.